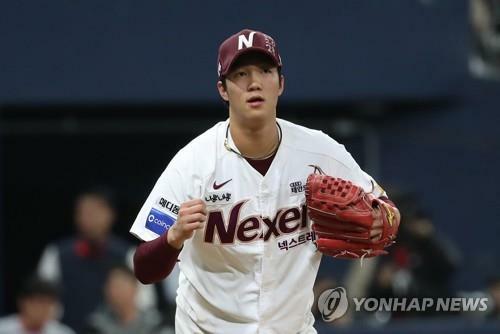 SEOUL, Oct. 31 (Yonhap) — The Nexen Heroes have forced a deciding Game 5 in the penultimate postseason round in South Korean baseball, defeating the SK Wyverns 4-2 at Gocheok Sky Dome in Seoul on Wednesday. The victory knotted the teams’ Korea Baseball Organization (KBO) playoff series at two games apiece. American slugger Jerry Sands blasted a two-run homer as part of his 4-for-4 day, and the Heroes’ stout bullpen backed a scoreless start by 19-year-old rookie Lee Seung-ho. An Woo-jin, another 19-year-old freshman, was credited with the win after four shutout innings in relief. The series will be decided Friday at the Wyverns’ home, SK Happy Dream Park in Incheon, 40 kilometers west of the capital. At stake will be a berth in the Korean Series and a date with the Doosan Bears, the top team from the regular season and champions from 2015 and 2016 seasons. The Wyverns have now lost two straight games after winning the first two games of the series at home. In the history of the penultimate series in the best-of-five format, 12 out of 14 clubs that took a 2-0 lead went on to reach the Korean Series. The 1996 Hyundai Unicorns and the 2009 SK Wyverns are the only two clubs to win three in a row after dropping the first two in the second round. The 1993 LG Twins and the 1997 Samsung Lions are the two other teams to even force a Game 5 after going down 2-0. The Wyverns failed to get on the board after the first two batters of the game walked. Early on, Lee Seung-ho looked every bit the teenager making only his second career postseason start. But the Wyverns let him off the hook and helped Lee get out of his own mess. With men at first and second, No. 3 hitter Choi Jeong struck out swinging on a changeup. Cleanup Jamie Romak, who broke his postseason home run drought Tuesday, hit a grounder to shortstop Kim Ha-seong, who got the force out at second. Sands put the Heroes on top by 2-0 with a two-run homer in the bottom fourth. 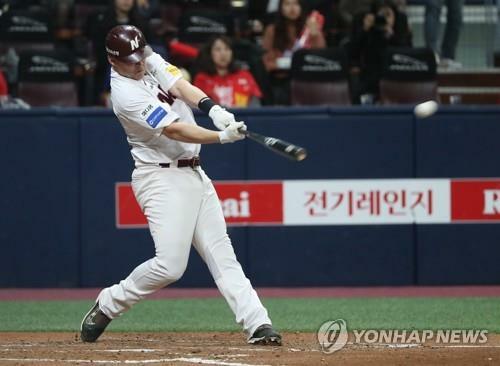 It was Sands’ second home run against SK starter Moon Seung-won in as many games. Moon made a relief appearance in Game 1 last Saturday and Sands jumped on a hanging slider for a three-run blast then. On Wednesday, Moon left another slider over the fat part of the plate, and Sands didn’t miss it. His frozen rope shot just cleared the left field fence, and gave in-groove starter Lee Seung-ho some breathing room. Lee was pulled after walking the first batter of the fifth inning, and the Heroes’ bullpen, which shut down the Wyverns over the final 3 2/3 innings Tuesday, stepped up once again. An Woo-jin, another 19-year-old pitcher, struck out the side in Lee’s relief, all with sliders. After striking out the first two batters he faced, An walked No. 3 hitter Choi Jeong. That brought cleanup Jamie Romak to the plate, but he went down swinging on a 2-2 slider. The Heroes doubled their lead in the sixth, thanks to an SK error and a timely hit by a slumping batter. With the men at the corners, Lim Byeong-wuk attempted a squeeze bunt. But the ball stopped just in front of the right batter’s box in fair territory and catcher Hur Do-hwan picked it up easily and Seo Geon-chang, the runner coming home from third, was caught in a rundown. But third baseman Na Ju-hwan, after receiving the ball from Hur, lost his footing and fell to his knees, and his throw home went off Seo’s body and rolled into the backstop. Seo scored to make it 3-0, and the runners were now at second and third. Kim Ha-seong, who had been 1-for-14 in the series, delivered an RBI single to left for a 4-0 Nexen lead. SK’s Han Dong-min, mired in a 1-for-15 slump, hit a two-run homer in the top of the ninth to cut the deficit in half. Kim Kang-min’s two-out double brought the tying run to the plate in the form of pinch hitter Jung Eui-yoon, who flied out to center to end the game. The Heroes managed just five hits in this game, and Sands got four of them himself. Of his home run, Sands said he wasn’t sitting on a slider from Moon, and simply reacted to that pitch when he saw it. In Game 5, it will be a rematch of starting pitchers from the opening game. The Wyverns will have left-hander Kim Kwang-hyun on the mound, opposed by American right-hander Jake Brigham. Kim was charged with five earned runs in six innings in Game 1 last Saturday, while Brigham gave up five earned runs in four innings. Both pitchers gave up two homers apiece and didn’t factor into a decision.